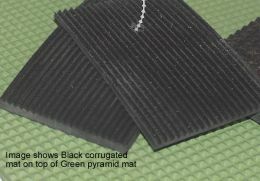 Corrugated rubber mats and runners made of top quality rubber. All rubber construction perfect for runners in any area where sure footing or protection of the floor is a concern. Custom cut lengths available. Shown in photo with pyramid matting swatches. 100% rubber made in the U.S.A.